In Central Pennsylvania our last frost-free day is typically the 15th of May and we’ll expect all the Spring happenings to be in full swing by then. Violets are blooming in earnest now. We have the Northern Downy Violet, Arrow-leaved Violet and the Common Blue Violet popping up in the yards and driveway. They don’t seem to mind the rocks and clay that we have for “soil” up here on the mountain. Early spring flowers of the familiar bulbs that herald Spring are already faded or dried up and blown away. The greenery of the crocus, daffodil, hyacinth and tulip are still growing strong and collecting energy for reproductive purposes. After the leaves yellow the bulbs can be dug up and replanted to allow them to spread out. 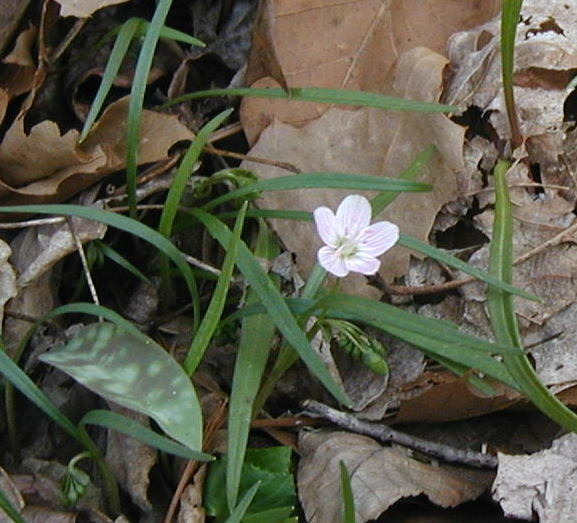 A native plant with a large bulb for its size is the dainty little Spring Beauty, Claytonia virginica. Early Americans are said to have eaten the bulbs or tubers as a potato substitute. They’re edible, but small. It would take quite a number of plants to make a meal. Spring beauty tubers are up to a half inch in diameter. Perhaps a nice thing to know if you’re leaning toward survivalism, but not worth digging really. Let’s just enjoy their beauty, shall we? 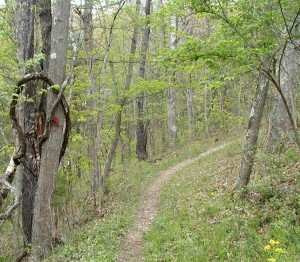 The Middle Ridge Trail at Little Buffalo State Park is marked with red blazes. It’s a difficult trail because of the steep terrain in some places. 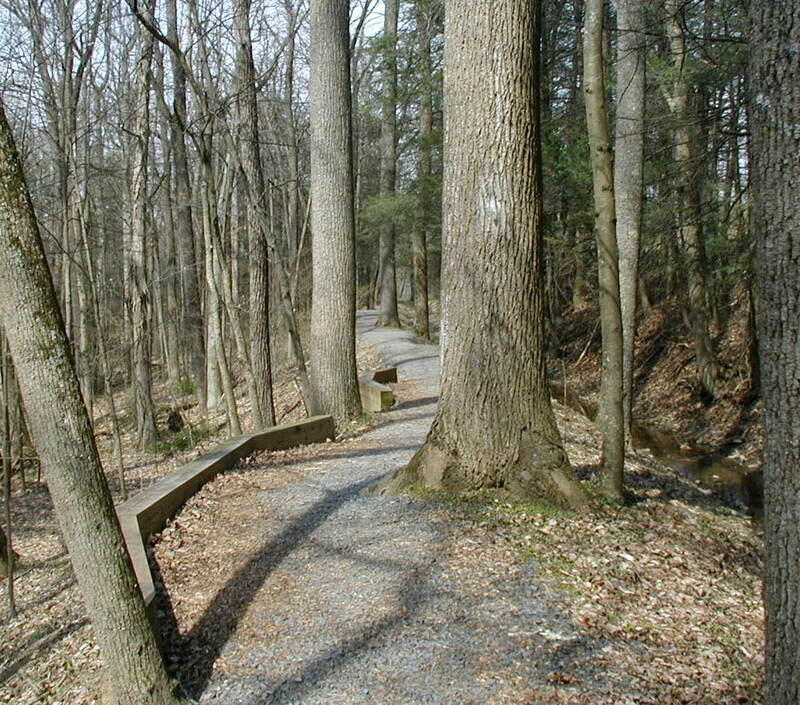 Fewer people travel this path as noted by the width of the trail. Perhaps that’s because the level of difficulty or the fact this area of the park is open to hunting. Maybe it’s location on the north side of the park is too far from the popular Day Use Area. That’s too bad as one wild flower blooms here that many people may not get to see elsewhere in the park – Early Saxifrage, Saxifraga virginiensis. 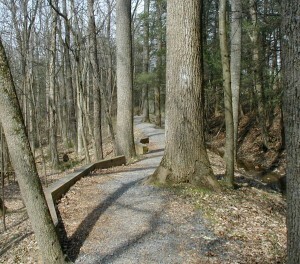 West end of the Middle Ridge Trail at Little Buffalo State Park in Newport, PA. Early saxifrage was plentiful on the west end of the Middle Ridge Trail. Lots of Early Saxifrage on the Middle Ridge Trail. 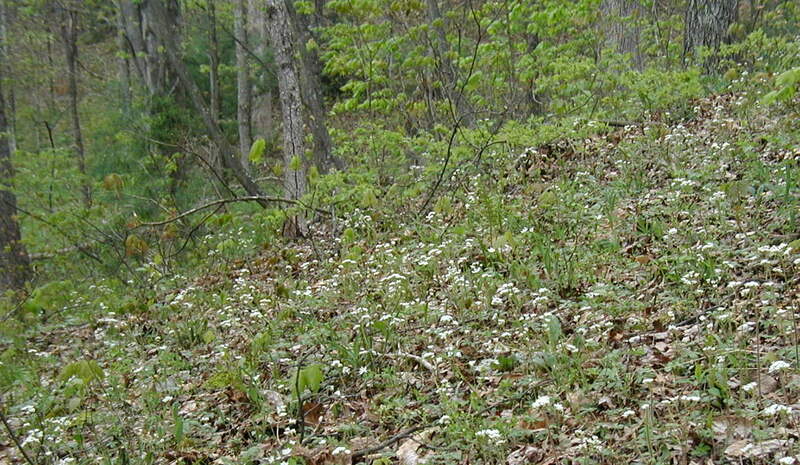 Nearly all the white flowers on the west-facing slope in the image above are Early Saxifrage. 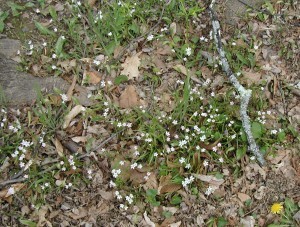 Star-like blossoms of early saxifrage. Clusters of early saxifrage flowers have a star-like appearance. The upper left cluster in the image above shows the branching of the flower cluster and the woolly flower stem. The flower stalks may reach 10 to 16 inches tall. 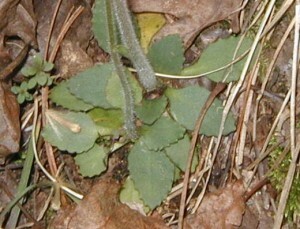 Leaves of early saxifrage are mostly basal ones. 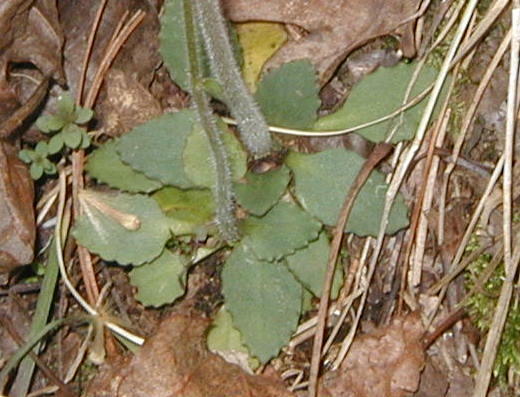 Very small lance-like stem leaves may or may not be present. The oval basal leaves have scalloped edges. In the image below you can see the flower stalks rising up from the group of basal leaves. Scalloped basal leaves of early saxifrage. Note that the flower stalks are hairy or fuzzy with hairs. Flowers of early saxifrage occur in clusters at the top of the flower stem. 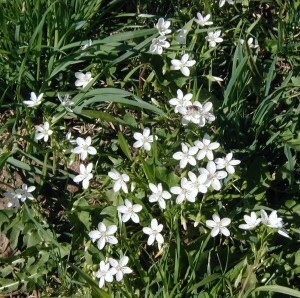 The five-petaled white flowers are small, only a quarter-inch in width. Small yellow-tipped stamens are visible inside the flower heads. Flowers of early saxifrage on flower stalk. Blossoms are at the tip of the flower stalk that rises up from the basal leaves. Note in the image above that there is one stem leaf at the point where a secondary flower stem branches from the main flower stem. Besides the western end of Middle Ridge Trail at Little Buffalo State Park, we’ve seen Early Saxifrage on wooded hillsides along country roads. 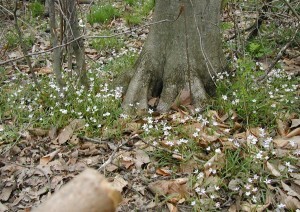 Cohorts included blooming spring beauty, rue anemone, fairy wings, ferns and hepatica (already bloomed). Spring beauty and early saxifrage blooming together. Spring beauty was blooming at the same time and place as Early Saxifrage. Early saxifrage and rue anemone blooming at the same time. 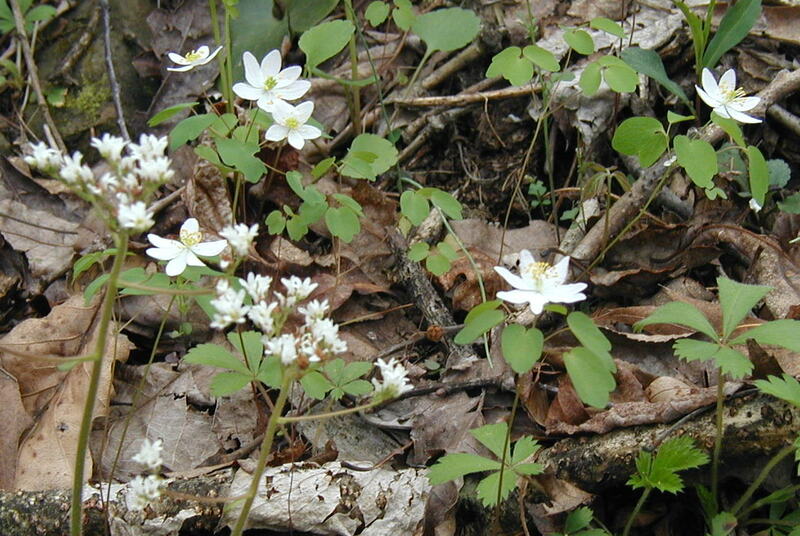 Rue anemone was blooming at the same time and place as Early Saxifrage. 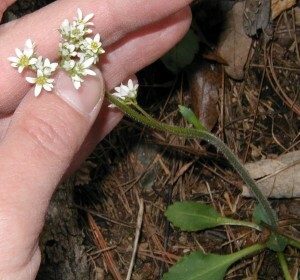 Early Saxifrage bloomed at least from the 15th to the 23rd of April in south-central Pennsylvania. 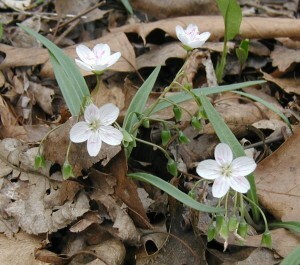 Spring beauty, Claytonia virginica, is one of the first Spring Ephemeral flowers that I learned to recognize. It is a dainty little flower with five petals and stamens. The anthers at the tips of the stamens are pink, which seems to add to its delicate nature. Loose clusters of Spring Beauty flowers. The loose clusters of spring beauty flowers may have one or more open blossoms and several other blossoms hanging down that are either spent or have yet to bloom. Blooms of spring beauty. Note the pair of linear leaves on each plant. Blossoms have five white rounded petals, many that have gray to pinkish lines, like the flowers in the image above. The whole flower may have a tinge of pink in addition to the pink anthers at the top of the five stamens. Colony of flowering spring beauty. Spring beauty can be found blooming en masse from middle to late April in central Pennsylvania. The dandelion was included in the image above for scale. 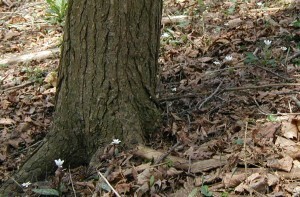 Group of spring beauties blooming at the base of a big tree. Spring beauty flowers opening up for the day. Spring beauty gets about as tall as the grass and its linear leaves help to hide it among the grass. The flowers in the image above seemed to be coming out of hiding as they started to bloom for the day. Their blossoms weren’t all the way open, yet. 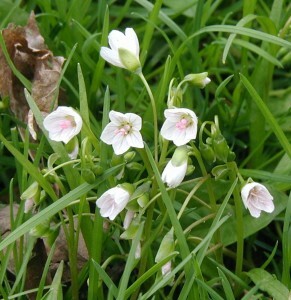 Note the pink anthers and lines on the petals in these loose clusters of spring beauties. Photos of this common spring ephemeral flower above were taken 18Apr2010 at Little Buffalo State Park near the covered bridge. Beautiful grouping of Spring Beauty blooming in the grass. I was a little surprised to see it still flowering a couple weeks later. The above photo was taken 30Apr2010 in the same area. That makes the little spring beauty one of the longest lasting spring ephemeral flowers that I’ve ever seen. Spring Ephemerals have had my attention for the past few weeks. I truly enjoy watching Spring take hold in the form of spying on my flowery friends. As the various plants arise from their winter sleep they sprout and put forth their beautiful blossoms for all to see. The Spring ephemeral flowers by their very nature are fleeting in appearance. You can see them one day and be glad that you did for the next day they could be gone until the next year. Part of my delight stems from the fact that I know most people will never go to the woods to see these beauties. Can I possibly derive pleasure from knowing that people will miss out on these beautiful displays? Not really, but I do feel privileged somehow. Instead of keeping all the fun to myself, I’ll keep posting pictures here to share with everyone. Soon, I’ll be offering an ebook or e-course on Spring Ephemerals, so stay tuned! Some years I’ve totally missed out on seeing some favorite flowers because one thing or another kept me from taking time to hunt them. This year I’ve vowed to get to the woods to see my favorites, which I have been lucky to do so far, and to find a few new friends. Set a goal to find five new flowering friends each season. 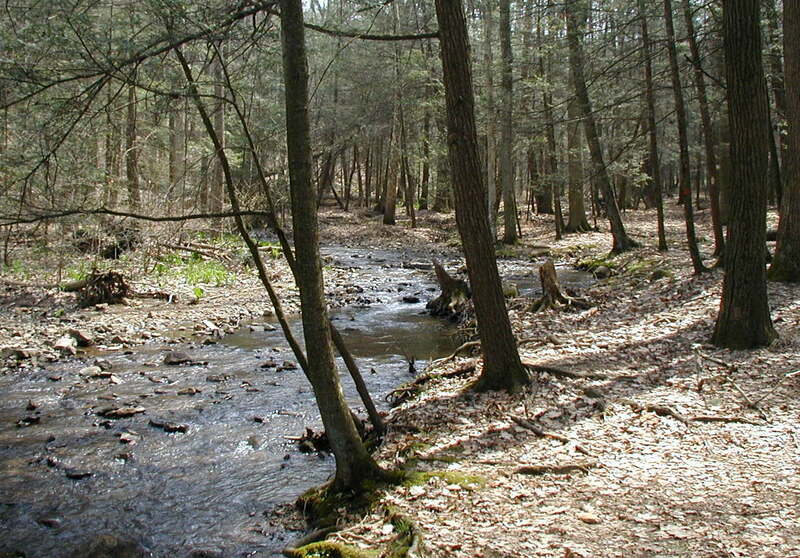 Walk or hike in the woods or on a nearby trail and observe nature. Find a favorite flowering plant and observe it through all four seasons. Make a photo-collage or screen-saver of your favorite flowers and leaves. Find wild flowers that are red, white and blue, or your favorite colors. Locate a berry vine and watch the flowers develop into yummy blackberries or black raspberries. Then, make jelly! Get outside and just enjoy the fresh air. Some of my old favorite spring ephemeral flowers include Round-Leaved Hepatica, Spring Beauty, Trout Lily, Bloodroot and Dutchman’s Breeches. Spring flowers that I hadn’t before seen or identified include Early Saxifrage, Bluets, and, no doubt, there will be more to be appreciated in the years to come. Spring ephemerals are just about done flowering for 2010. The trees are at least 50% with leaves developed, so the time for spring ephemeral flowers is almost over. Time for one more walk in the woods! For a couple weeks we had seen a few spring beauties here and there, but nothing like what we saw today. 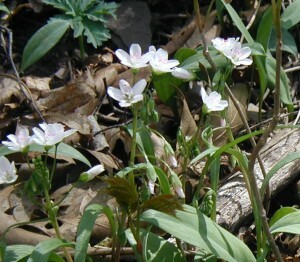 Colonies of hundreds of the spring flower, Spring Beauty, Claytonia virginica, were flowering in the sunshine. On the hillsides in the woods along the river road spring beauty blossoms were shining in the sun. Spring Beauty blooms all over the hillside. 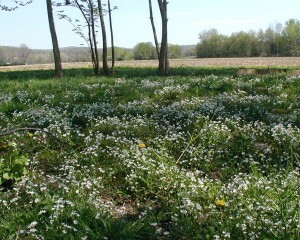 The highest patch of ground in the image above was absolutely covered with the white, five-petaled flowers of Spring Beauty. Telephone pole included in shot for scale. White blooming spring beauty with blue ground ivy blossoms. Pollinating bees visit the spring beauty flowers. The light blue flowers are ground ivy that often occurs in the same areas as spring beauty. Other cohorts include the common blue violet, chives, mayapple and trout lily. 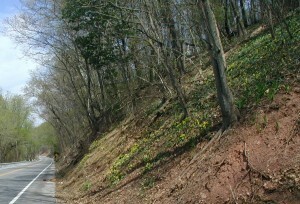 Areas along the road in this hilly area near the Juniata River had huge patches of flowers. Mass of spring beauty flowers on both sides of the old canal. 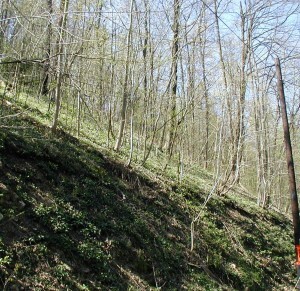 In the image above a huge colony of spring beauties is separated by the old canal. Next to the river plenty of Spring Beauty flowers were blooming. Spring beauty can be found in moist woodland areas, especially next to rivers, creeks and backwaters. Looking down on a bunch of Spring Beauty blossoms. This Spring ephemeral is small, only getting the height of the grass and dandelions. 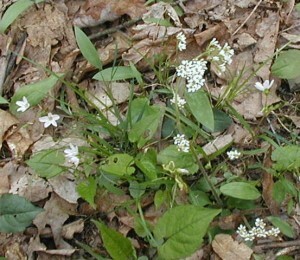 A pair of linear, or grass-like, leaves occurs halfway up the stem. The flowers occur in loose clusters with first a single bloom followed by several at once, like we see here in this mass blooming. Looking across the mass of blooming Spring Beauty flowers. Mass of blooming spring beauty. Note the river in the background above. 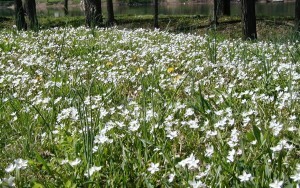 Large group of flowering Spring Beauty among the grass. 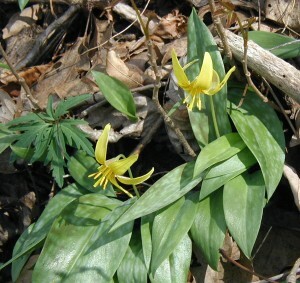 In Pennsylvania one of the Spring Ephemerals that blooms in early April is the Trout Lily, Erythronium americanum, which is also called Adder’s Tongue or Dogtooth Violet. 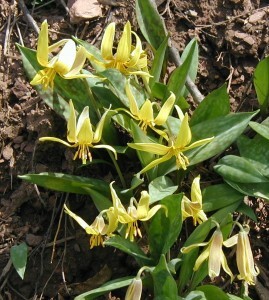 Trout Lily is a better or more descriptive common name because the trout lily is a member of the Lily family, Liliaceae. If you know traits of the Lily Family, then you’ll be able to recognize that trout lily is a lily. It’s supposedly named for blooming at the time when the trout are running, or spawning. Since April 3rd was the first day of trout fishing season here, the name trout lily might be right on. You’ll probably first notice the foliage of the trout lily as it is visible for many weeks, yet the blossom is out for a short time, perhaps a week at the most. The flowers in these photographs, taken 8 April 2010, were gone by the 13th of April. We found a colony of trout lilies blooming along my favorite river road. It was easy to spot their yellow flowers on the west-facing slope that overlooks the Juniata River. 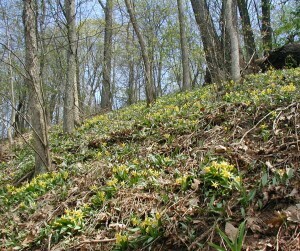 Large group of trout lily blooming next to the river road. 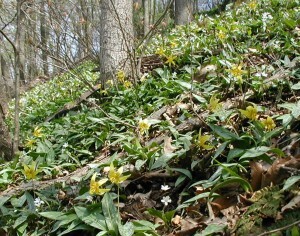 Colony of blooming trout lily. Looking up at trout lily blooming on the hillside next to the river. 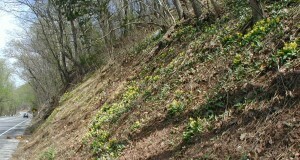 Looking up the hill at all the yellow trout lily blooms. Small group of trout lilies flowering. Flowers at the bottom of the image are just opening their bell-shaped blossom. Once open the petals flare backward exposing the bright yellow stamens. Trout lily flowers and leaves. 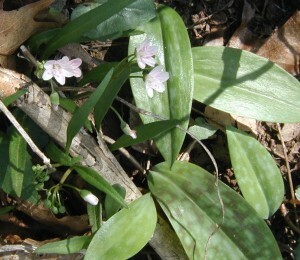 The palmate or divided leaf on the left in the image above is a cut-leaved toothwort, which was growing in small patches among the trout lilies. 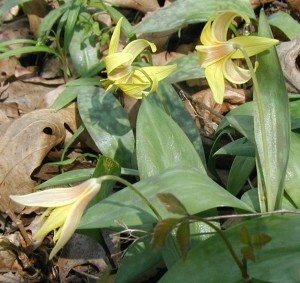 The thick, sword-like leaves of trout lily come to a point at the tip and are mottled with dark green to maroon on a light green background, or vice versa. Found in wetland areas, natural water drainage areas next to creeks, rivers, lowlands. Close-up of trout lily flowers with yellow stamens. One to three lance-like leaves per bloom and sometimes you find a large number of single leaves with no blooms on this perennial spring flower. 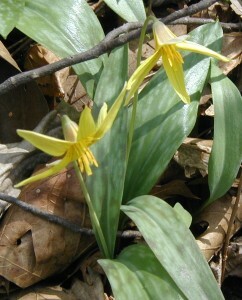 Trout lily flowers are the tallest part of the plant and they reach 8 – 10 inches tall. The under or back side of the yellow petals is streaked with brown, and more so on the three outer petals. Petals of trout lilies flowering. Oh, see those three little leaves in the foreground? Well, I certainly didn’t. In my enthusiasm for the opportunity to photograph these flowers I neglected to check for poison ivy, but that’s what I got! Never used to as a kid. Use caution if you’re going in the woods, no matter what time of year. All it takes is one brush with the poison ivy plant and you could be itching for a long time. Take my word for it! Spring beauty blooming as trout lily cohort. Spring beauty flowers and the mottled leaves of trout lily. Also blooming in the same area were Spring Beauty and Cut-Leaved Toothwort. Trout lily and spring beauty blooming together. 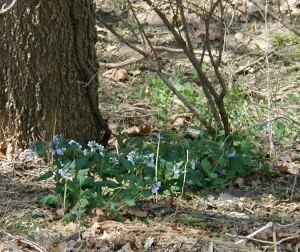 Across the road on the river side, a small patch of Virginia Bluebells, Mertensia virginica, were blooming at the base of a tree. Virginia bluebells blooming next to the river. On the east side of the Juniata River these bluebells were blooming on the 8th of April 2010. 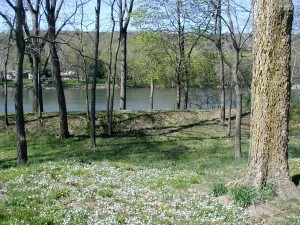 From what we’ve seen on the Juniata River it seems that river banks and the adjacent lands might be great places to search for spring flowers. If you can find a trail near you that runs through river side areas, take a hike and let us know what you find. 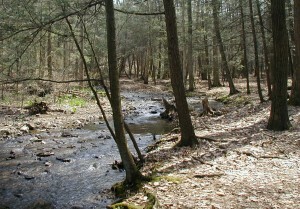 At the Day Use Area of Little Buffalo State Park in Newport, Pennsylvania there is a lot to do. 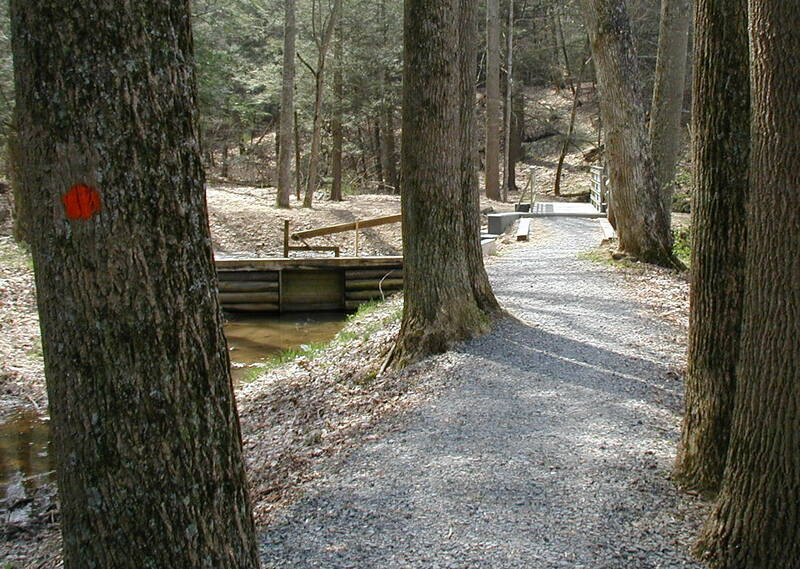 Besides picnicking and grilling at the provided picnic tables and pavilions, you can appreciate nature and a couple historic sites by walking the Mill Race Trail. 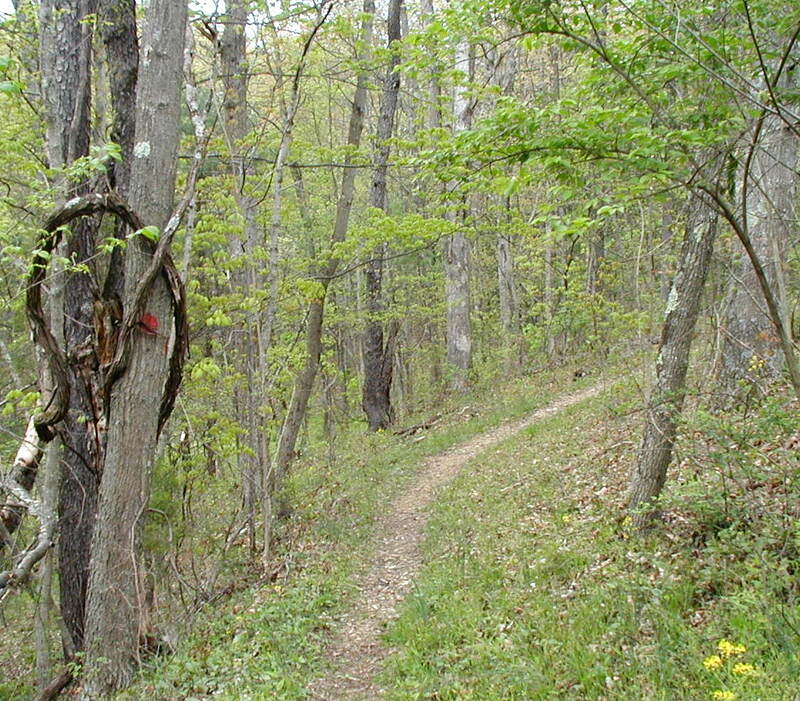 Mill Race Trail is wide in most places, mostly flat, and only a half-mile long, so it can be considered an easy hike. From the parking area head away from the lake and toward the covered bridge. Pass through Clay’s Bridge, a covered bridge that was originally located one mile west of its present location. It had to be moved when the dam for Holman Lake was built. The bridge was built across Little Buffalo Creek a little upstream from the lake. Shoaff's mill large steel water wheel. Water released from Holman Lake is diverted down the “mill race” to the water wheel. It is this race of water that the Mill Race Trail follows. Water flowing over the wheel turns the wheel and the mill grindstone. The water wheel also operates gears, pulleys and ropes that assist in transporting materials from floor to floor of the mill. 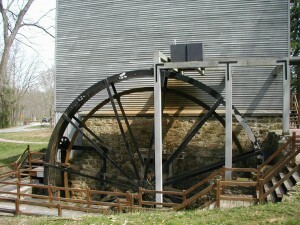 Shoaff’s Mill is still operational and demonstrated the third weekend in October during the Old Fashion Apple Festival. If you walk the Mill Race Trail, you can’t miss it! Be sure to check out the collection of grindstones or millstones at the front of the mill. From the water wheel follow the path that the water would take to get to the mill. 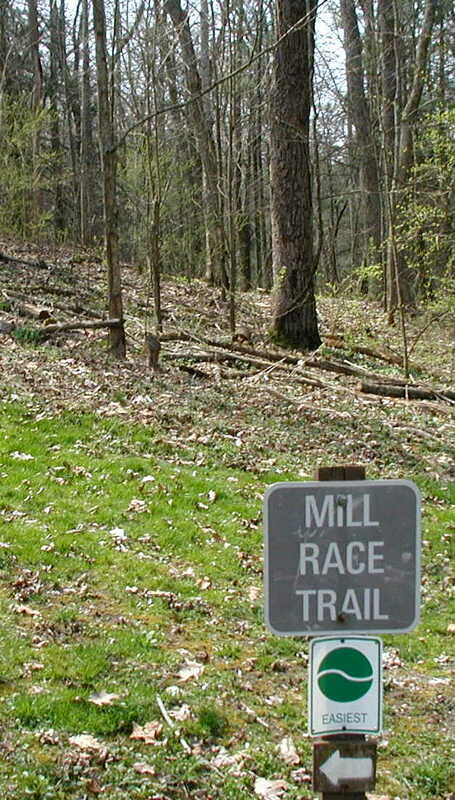 Look for the Mill Race Trail sign and follow the arrow. Trail sign for Mill Race Trail at Little Buffalo State Park. 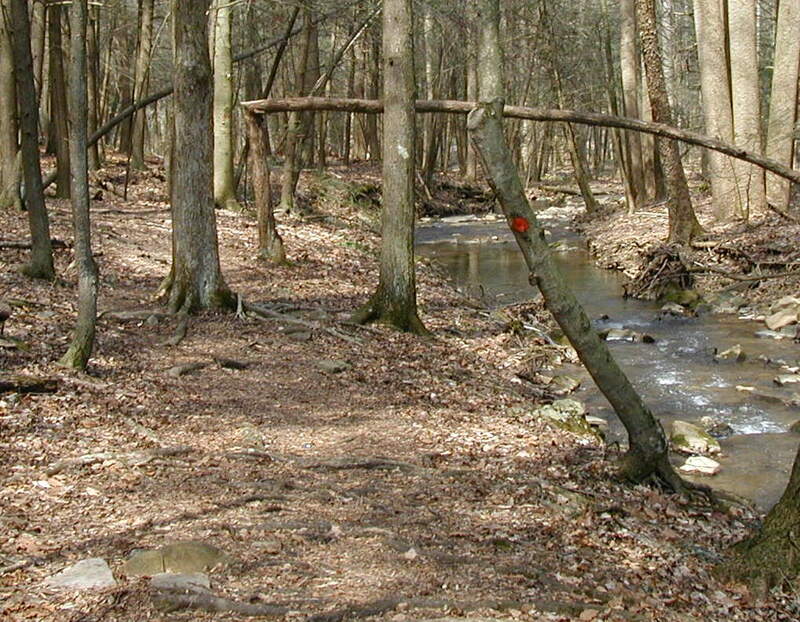 The wooded hillside in the photo above is a great place to see bloodroot, spring beauty and trout lily flowers in early April. Bloodroot flowers on the forest floor. 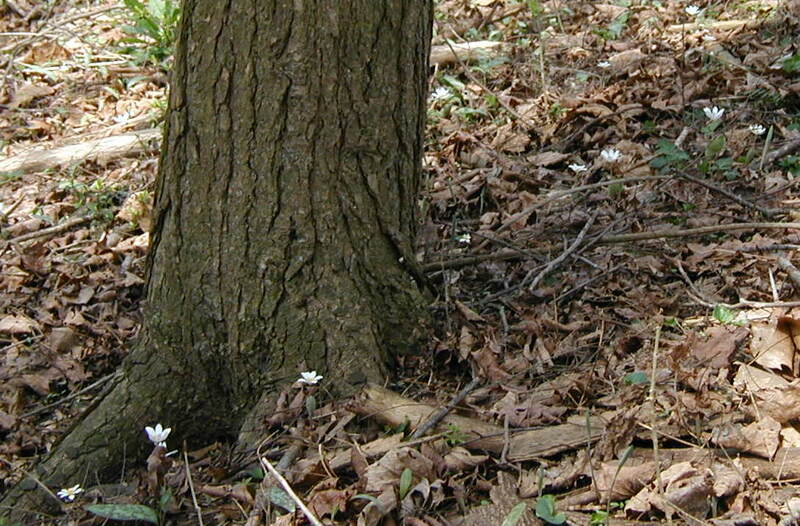 Look for individual bloodroot plants to flower before their leaves are out. A single bloom is followed by one leaf for each plant. 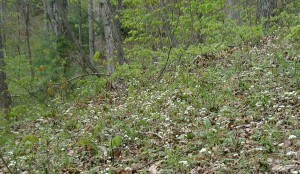 Large grouping of bloodroot flowering. Bloodroot flowers have eight white petals and bright yellow stamens that project from the center of the flower. Spring beauty is another of the spring ephemeral flowers occurring in these woods. Spring beauties have leaves that look like grass and they’re about as tall. 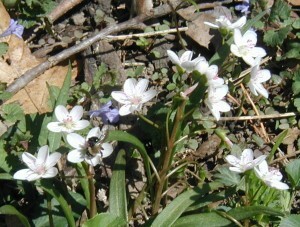 The flowers are small, the size of a nickel or dime, with five rounded white petals that may or may not have pink lines. The anthers at the stamen tips are very noticeably pink. Spring beauty flowers bloom in clusters, but often only one flower is open at a time. Spring beauty blooming in April. The mottled, thicker leaf on the left in the image above is the leaf of a trout lily that has not yet bloomed. Trout lily flowers appear for a very short time after the bloodroot has begun flowering. Mill Race Trail follows the mill race. The image above looks back toward the mill. Note the mill race on the right. Water gate at the head of the mill race. Water level in the race, and therefore the amount of water going to the mill, is controlled by a gate that you can see in the image above. Note the red blaze on the tree that marks the Mill Race Trail. From here you cross over the mill’s water source and follow the path to the right. This part of the trail is a little more natural, so watch for those tripping rocks and roots. Mill Race Trail goes through a wooded area at the far end of the trail. Looking back up the creek is a scenic view under the hemlocks. Mill Race Trail along the creek. The end of the Mill Race Trail empties out into a wide path. Go right to get back to the covered bridge. 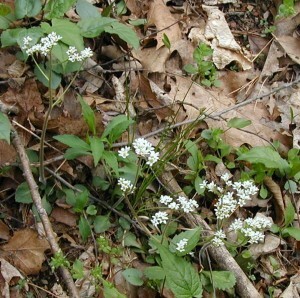 Either side of the trail in this section has plentiful spring ephemerals flowering in April. 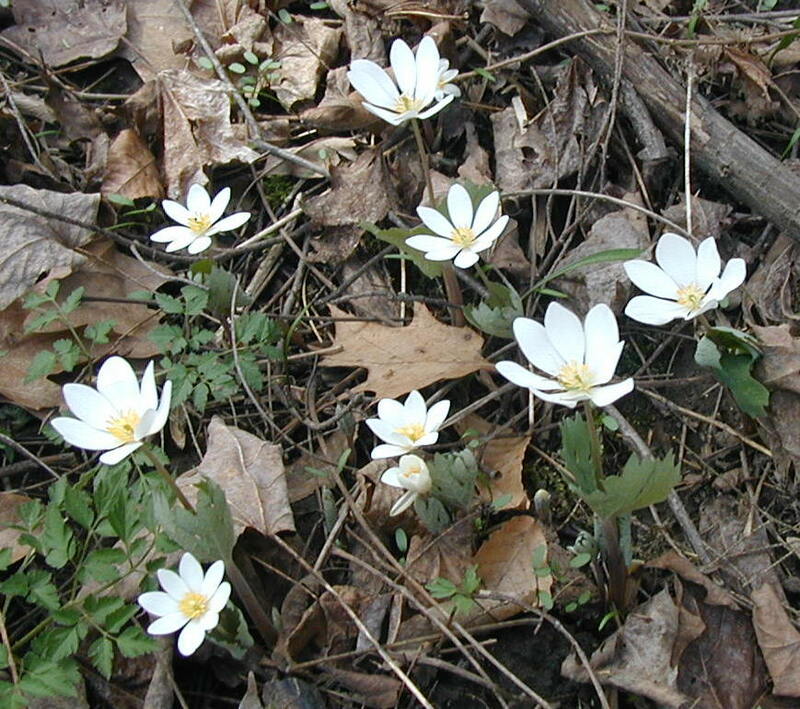 If you go, look for bloodroot, spring beauty and trout lily spring flowers. Take Route 34 exit off Route 322, go south on Route 34 through Newport, PA and just after a sharp bend in the road to the right (near the feed mill), turn right onto Little Buffalo Road. Continue for a mile or so and turn left onto State Park Road. Pass in front of the Blue Ball Tavern Museum and cross the one lane bridge. Turn right onto the first lane and proceed to the parking area on the left. 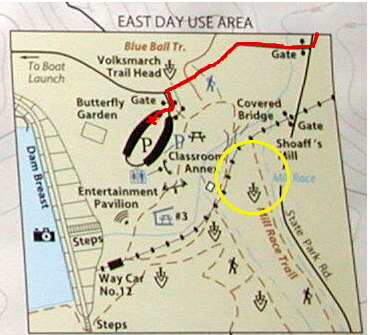 The red path shows how to get to the Day Use Area and where to park. The yellow circle marks the best place to find Spring wild flowers in Little Buffalo State Park. The Day Use Area is set up for picnics with plenty of picnic tables and pavilions, grills, a playground, and easy access to trails and scenic overlooks. Walk toward the creek and through the covered bridge. Take the Mill Race Trail if you want to see the Spring wildflowers. 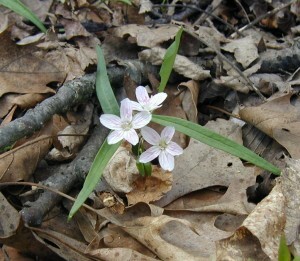 It’s an easy trail, only one-half mile long, and it is the best place to see the Spring Ephemeral flowers at Little Buffalo State Park. 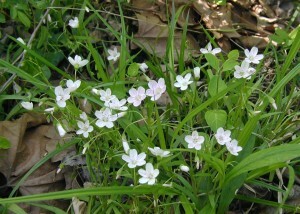 You’ll see some wildflowers on the hillsides and other flowers in the lowlands near the creek. 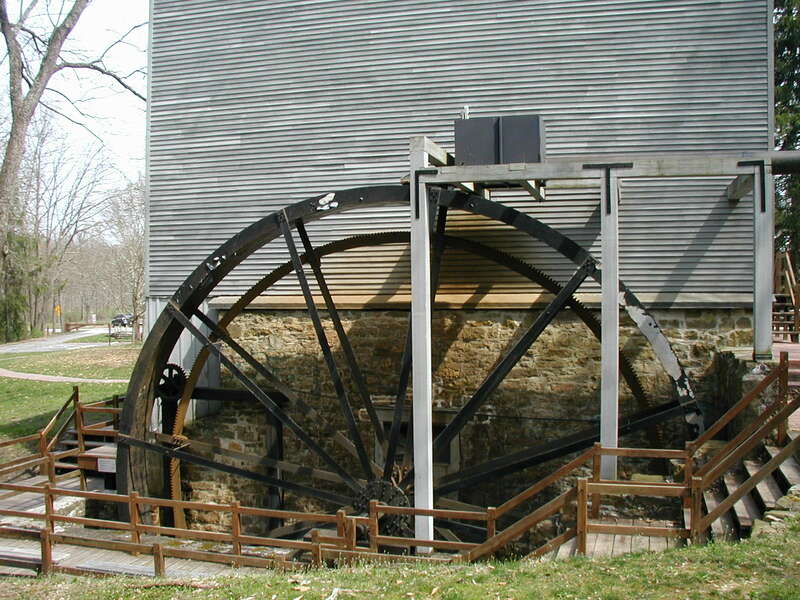 Shoaff’s Mill is an attraction in itself – the water wheel is supposedly one of the biggest in existence! Also saw the sword-like leaves of the trout lily, but its yellow flowers were not visible yet. Spicebush trees or shrubs were blooming along the far end of Mill Race Trail near the creek. Bright yellow clusters of flowers bloom all along the length of the branches before any leaves appear. If you’d like a more challenging hike, stop by the visitor’s center and pick up a map of the park. Try the Volksmarch 10K loop, the Buffalo Ridge Trail, or the Fisherman’s Trail.